The last week has been very busy for me. You know how when you’re in college and you’re taking finals and you long for the days when you have a 9 to 5 job with no papers, finals or homework? And then you graduate, get a real job, and long to be back in school even if it means studying for finals? Well, I was like that. Now, after three weeks of grad school, I find myself jealous of those 9-5ers again! I forgot how overwhelming school can be at times. I guess the grass is equally green on both sides! These days, I try to add a few veggies into my quesadillas. Want to know a secret? 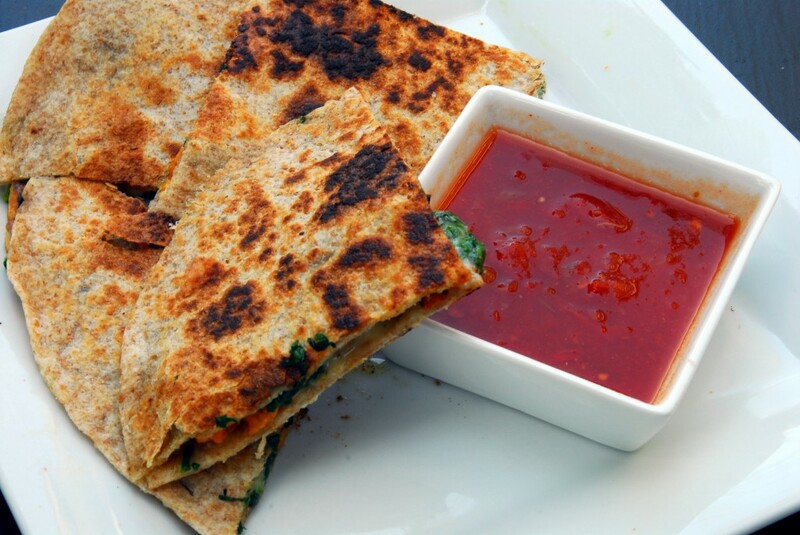 Adding veggies makes a quesadilla more tasty! Who knew?! Not my 15 year old self, that’s for sure! My favorite combination is sweet potato, spinach and cheddar. I swear, sweet potatoes and Mexican food are a match made in heaven. This meal is simple, easy to make, quick, and delicious! The only step you have to do ahead of time is roast your sweet potato. I tend to like to roast a couple on the weekend to have ready on hand for meals throughout the week. That way, this dinner comes together in less than ten minutes. Directions aren’t really necessary, but for any quesadilla novices out there, here ya go! 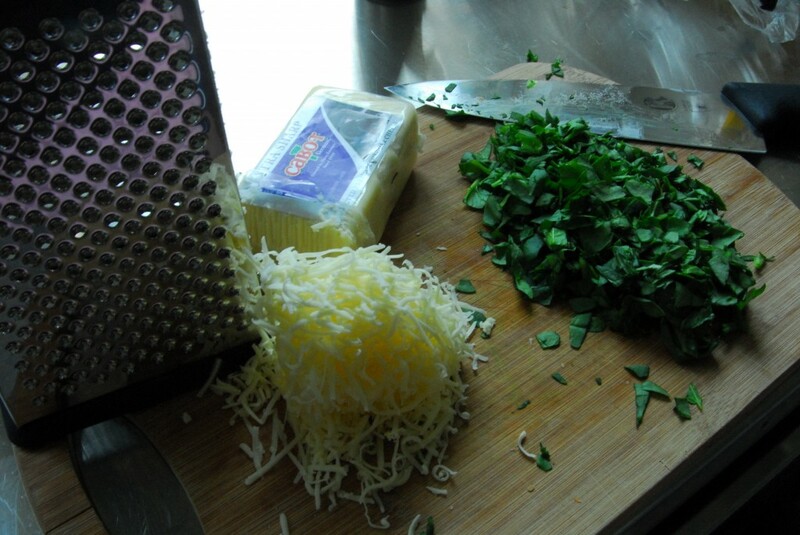 Chop up your spinach and grate your cheese. Then throw a teaspoon or so of olive oil on a skillet over medium high heat. Cook the quesadilla for about 3 minutes per side, until the cheese is melted and the tortillas are lightly browned. 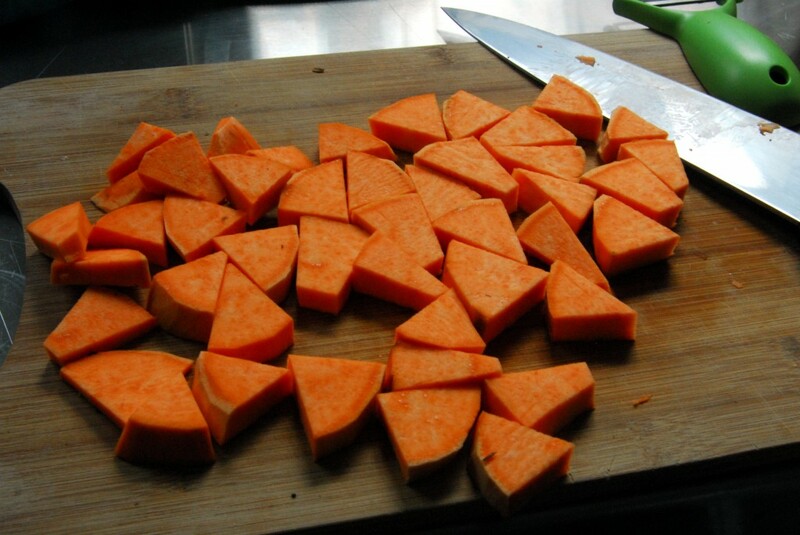 Peel and chop your sweet potato into bite sized pieces. Roast it at 425 for about 30 minutes, flipping once. Assemble your quesadilla. 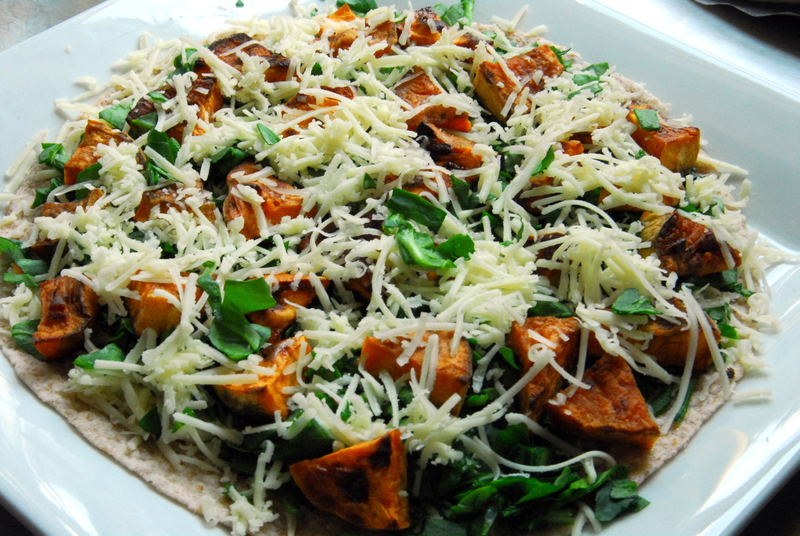 Place an even layer of sweet potato, spinach and cheese over one tortilla, followed by another tortilla on top. Throw a teaspoon or so of olive oil on a skillet over medium high heat. Cook the quesadilla for about 3 minutes per side, until the cheese is melted and the tortillas are lightly browned. Enjoy with your favorite salsa! 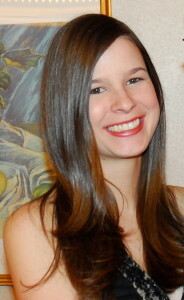 This entry was posted in Mexican, Recipes, Vegetarian and tagged cheese, mexican, sweet potato, vegetarian. Bookmark the permalink. man i kind of miss school now that i have a job… but i have strange hours that go from like 9-7 or later so I can see why school would be better. Alex @ therunwithin recently posted..It’s True. Haha I’m the opposite right now — I long to be back in school. I guess the grass is always greener 🙂 I’m definitely trying this! Quesadillas have always been a go-to meal for me too. I use brown rice tortillas now, and have fun mixing up the fillings. One of my favorite combinations is shredded chicken, jack or mozzarella cheese (any cheese works though), spinach and avocado. I’ve never tried adding sweet potato though; it sounds delicious! Sweet potato quesadillas, YUM! I’ve pinned a handful of similar recipes and finally need to put our new panini press to use!!! 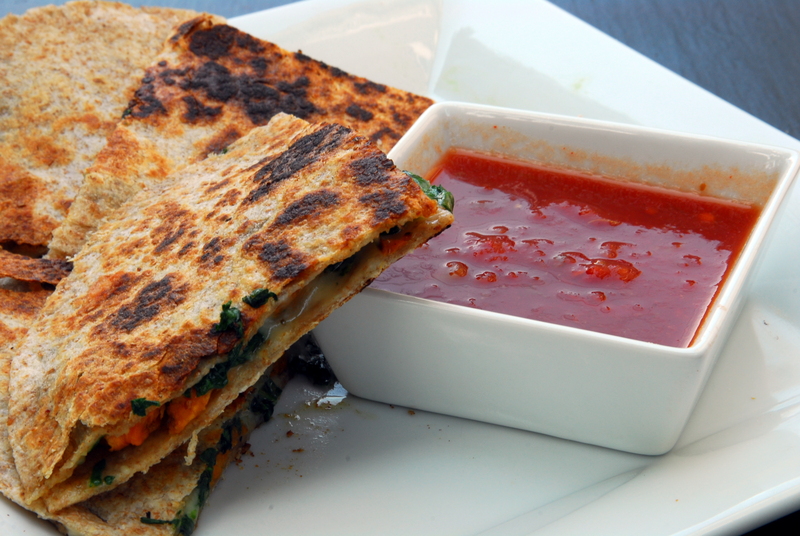 I’ve never used a panini press on a quesadilla but I bet it works wonderfully!